T-Gel shampoo is marketed to treat scalp itching and flaking due to conditions like dandruff, psoriasis and seborrheic dermatitis. The product is often recommended by dermatologists and is available over the counter. If the product is safe for humans, can it be used to relieve dandruff or related skin conditions for your dog? T-Gel shampoo is considered a medicinal shampoo and is not intended to be used by anyone on a daily basis. The shampoo itself is dark brown and has an odor to it. It is considered to be a highly effective treatment for many scalp ailments, especially when typical dandruff shampoo products have not worked. Its generic name is coal tar shampoo, and T-Gel is just one of many brand names that utilize coal tar. Active ingredient percentages may vary slightly by product, but typically contain about 2 percent coal tar extract with the rest of the ingredients being inactive. Can T-Gel Shampoo Be Used on Dogs? T-Gel shampoo should not be used on your dog or any animal for that matter. It is a strongly medicated shampoo and can dry out your pet's skin to the point that the dog will need to be seen by your veterinarian for treatment. The active ingredient of coal tar can actually burn or damage your dog's tender skin and make the treatment much worse than the problem you are trying to treat. 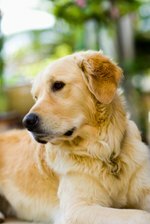 What Danduff Treatment Options Are Safe for Dogs? If your dog has dandruff, don't use any type of dandruff shampoo that is marketed to people. Instead, look for pet shampoos or treatments. Medicated pet shampoos are available at pet supply stores or online and should contain the ingredients sulfur or salicylic acid. If you have been using a flea shampoo on your dog, stop using it and switch to another flea protection treatment because those flea shampoos can be very drying to a dog's skin and may be the cause of the dandruff. If the problem continues or is severe, consult with your veterinarian. If your dog has dandruff, regular bathing using a non-drying pet shampoo can help to remove flakes and make your dog feel better. The frequency of baths may vary depending on your dog's breed and lifestyle. However, keep in mind that too frequent baths can strip your dog's coat of necessary oils and cause dry skin to develop. If your dog spends a lot of time outdoors, more frequent baths may be needed but if your dog is an indoor pet or has a smooth coat, baths may only be needed on occasion.